Some of you already know that I struggle with imaginary play.... but I do like to make things for imaginary play. I take those things to my mothers' group so Cakey can enjoy imaginary play with her friends and their mothers.... who are all so much better at it than me. 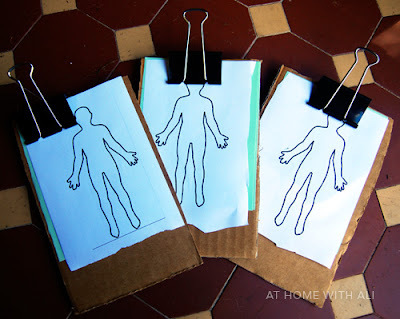 I made some doctor charts that were inspired by Inner Child Fun's miniature doll clipboards. It was so simple. I cut up small pieces of cardboard for the base of the chart. I then secured loose pieces of paper to the cardboard charts with a bull dog (or binder) clip. I printed out some little body outlines so the children could mark down the location of their patient's injuries. You can download the body outlines as a pdf file here. 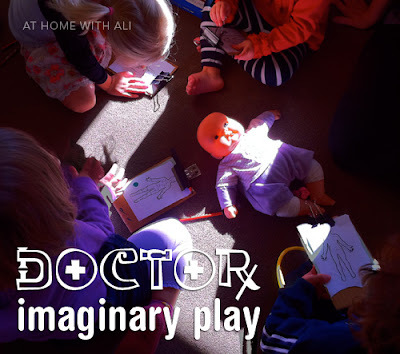 The kids loved this activity and played doctors until morning tea time. There were some seriously sick patients at the hospital clinic as you can see by some of the charts. Thanks for letting me know about your resources. We love playing doctor! 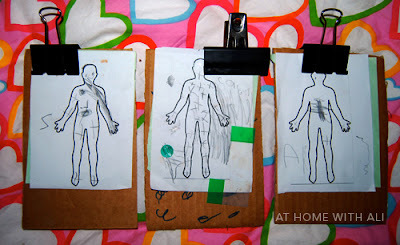 I love the clipboards made out of cardboard. I have been wanting to make a doctor chart forever so you have given me some good ideas! oooh I would love to see your doctor ideas. My 2.5 year old is going to love this!! So simple and fun. I will have to try this. I love that you have a free printable too. I hope the printable downloaded easily for you. I never would have thought of it if I hadn't seen Valerie's tiny doll clipboards. That sounds very fancy.... and pretty cool. What a fun addition to doctor play!! And so easy to set up too! It took no time at all. Oh, how fun!! My daughter loves playing doctor. I will have to print some out for her. I couldn't believe how long the kids played with them. how fun! thanks to Doc McStuffins, my son has started being interested in this type of thing! looks like your kiddos are already there! thanks for linking this up! Yes this sort of play is happening more and more, thankfully we have a great playgroup so Cakey can pretend play with friends of her own age. this is brilliant. my son loves playing doctors and makes nearly everything into a stethoscope and has recently discovered that toilet paper makes good bandages (groan!). This would be a fab addition. Thanks so much for this printable--what a good form to use with pre-readers! I can't wait to introduce it to my group of mini doctors this afternoon. I can't wait for my kids to get a hold of these.... Thank you for sharing.